Recently my husband bought these pancake & sausage on a stick things for breakfast, like a breakfast corn dog with pancake instead of cornbread. A blueberry pancake. I took my first bite at my work desk & it was pretty tasty. Then I looked down at my breakfast pancake dog & saw that it was purple. Like, really purple. Marie from Breaking Bad would love these. But then again, who wouldn’t like pretty food? 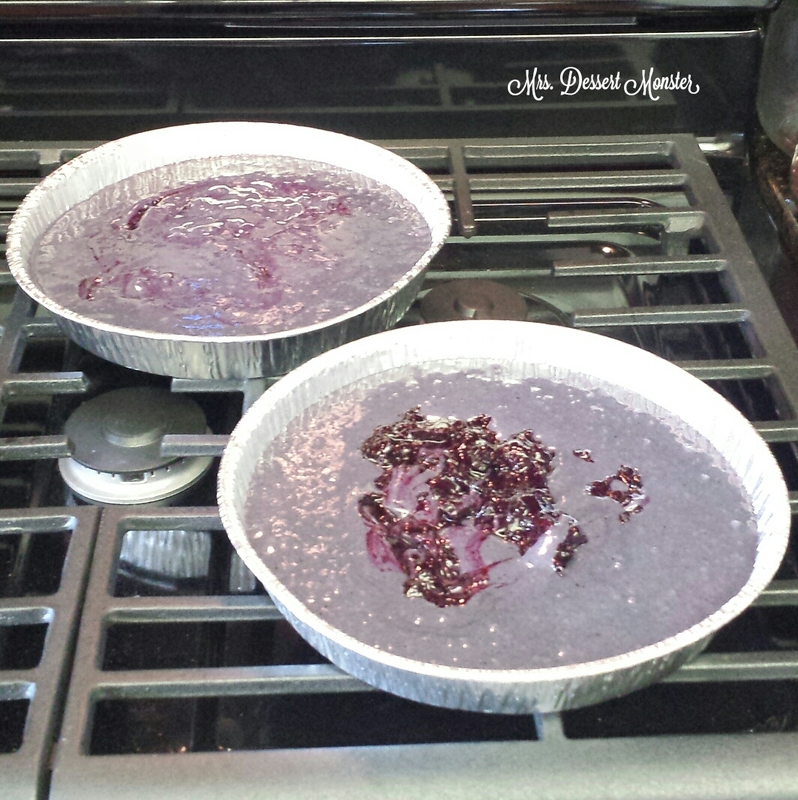 Somehow this lead to me wanting to make a purple cake for the 4th of July. I was unamused with my search for a blueberry cake recipe. They all basically said, “toss some blueberries into your cake. Done.” So I sort of came up with my own, using boxed cake mix. This is becoming my pattern. I like it! I didn’t just want pieces of blueberry in my cake, I wanted my whole cake to be blueberry! 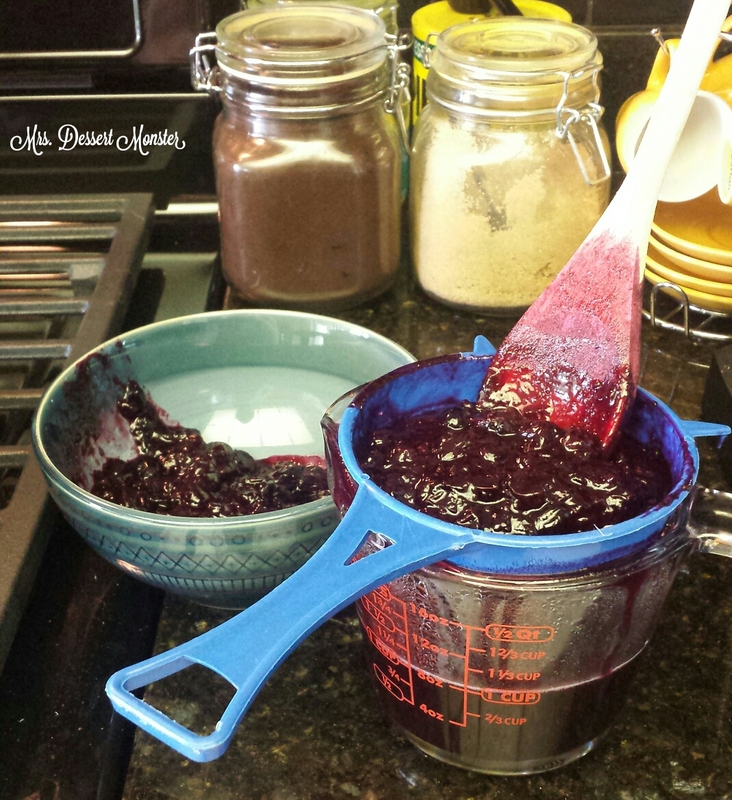 I started by making a blueberry ‘sauce’. I’m really not sure what to call it. It wasn’t really reduced, I just cooked the blueberries with lime juice & sugar to make a liquidy blueberry concoction. Then I strained my concoction to get 1 cup of liquid. I used this to replace a cup of water from the boxed white cake instructions, & saved the solids to be added to the cake batter later. While the cake was baking, I made lemon buttercream. It was my first time making it. 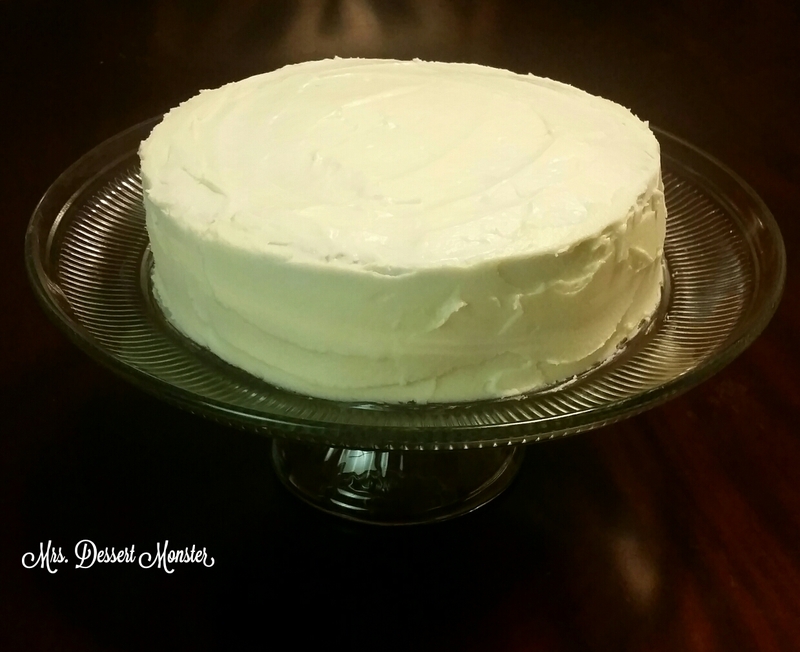 My mother in law makes delicious buttercream all the time & never uses heavy cream. I took her word for it & got good results using 2% milk. Mmm! After baking for approximately 30 minutes & cooling, I frosted my colorful cake. I got to taste a little bit of it when I was leveling the cakes to stack them. More mmm! 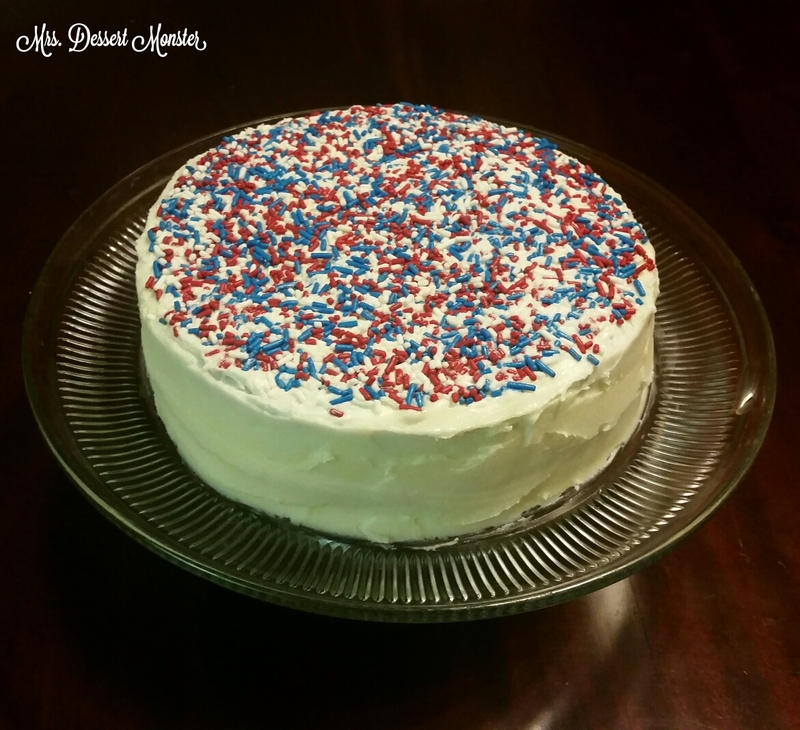 Since this cake was for the 4th of July, I got a little patriotic. I should get bonus patriot points because red & blue mixed together gives you purple. I was so excited to serve this homemade dessert at our first big shindig at our new house. 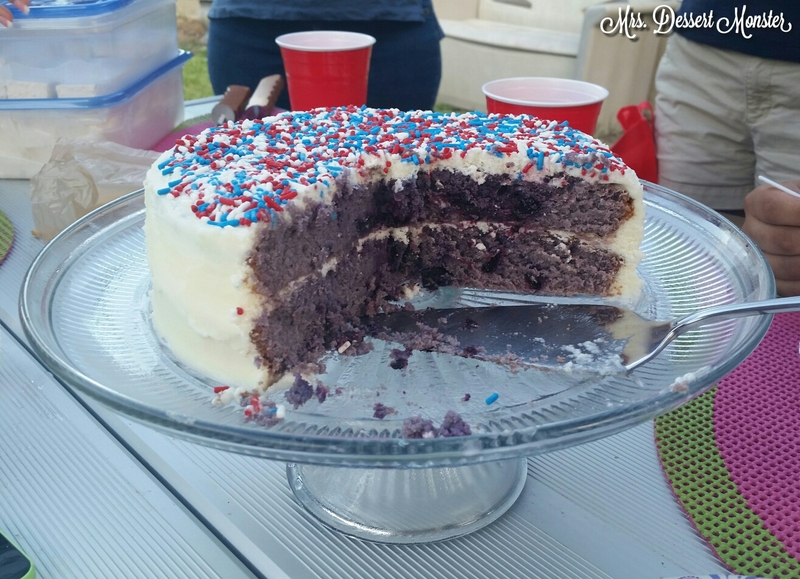 We had our families & Sunday school friends over for a 4th of July party. This cake was so good, everyone has some even though we were already stuffed to the gills. The cake & the party were a big success! Remove stems/leaves from blueberries. 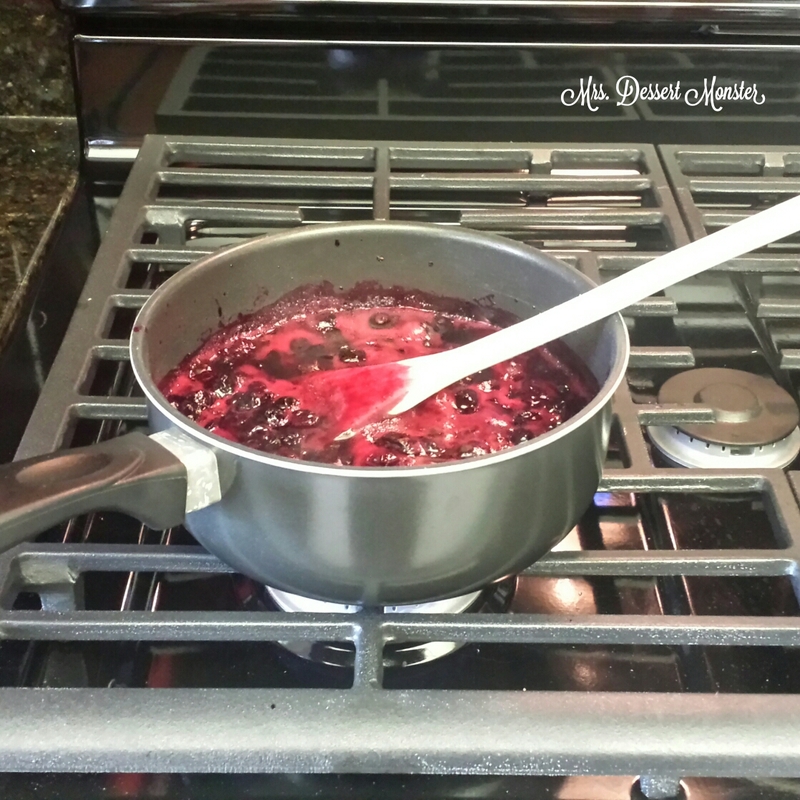 In a medium saucepan, cook blueberries, lime juice, & sugar for 3-5 minutes. Mash up the blueberries a bit. Strain the blueberries until you get about 1 cup of liquid. Save the blueberry mash. 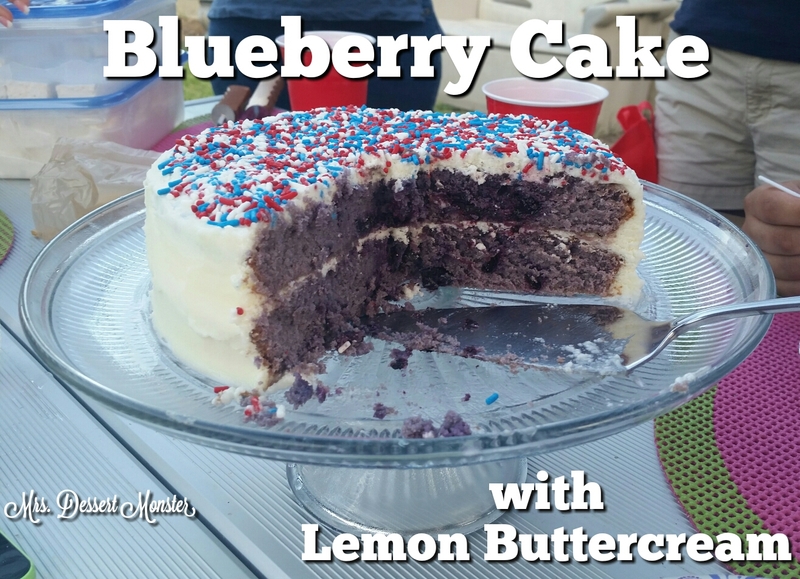 With an electric mixer, mix eggs, water, blueberry liquid, oil, & box cake mix on low for 30 seconds. Then mix on medium for 2 minutes. Pour cake batter into 2 8″ round cake pans. Spoon blueberry mash into cake batter & mix. Bake for about 30 minutes, until set in the center. Beat softened butter on medium speed with the paddle beater for about 3 minutes. Add sifted confectioner’s sugar and stir on low until incorporated. Add lemon extract and milk. Beat on medium-high for 3 minutes. 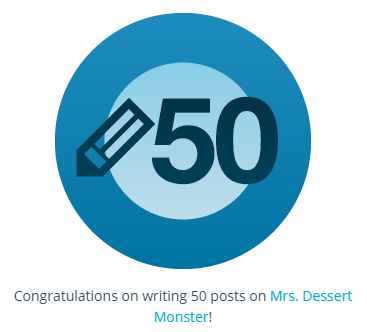 This is my 50th post! I’m very excited about that. This blog has helped me in ways I could never have anticipated when I started it in January. I have never thought of the lemon blueberry combo. I bet it’s delish! It was! You gotta try it. The lemon buttercream is tart enough to be used maybe on blueberry muffins or something more breakfast-y! I love lemon and berries together. This looks beautiful! This cake looks so delicious! Great recipe Gina! Thanks for sharing at Inspiration Thursday. Have a great week!